Brought to you by the Student Alumni Association (SAA) in partnership with University Advancement, the 3rd annual True Blue Month will be held throughout November to educate our campus community about philanthropy at Seton Hall. Last year, the Student Alumni Association was recognized by CASE ASAP for “Outstanding Student Advancement Program” within District 2 for True Blue Month. Join us in celebrating the award-winning True Blue Month this November, and thank our #HallTrueBlue supporters! To recognize faculty, staff, and administrators who have given to SHU in the last year. SAA will be distributing door hangers to employee donors on the South Orange and IHS campuses and thanking them throughout the day. Employees who have completed the four steps toward becoming True Blue last year will receive an additional thank you item. George M. Ring Building from 5 - 9 p.m. This annual event takes place for SAA members to thank donors for supporting the University through their treasures and talents. In addition to calling donors to thank them, SAA members will also wish them a happy Thanksgiving, and holiday ahead. Monday, November 26, 10:30 a.m. - 4 p.m.
One of the most important aspects of True Blue Day is visually demonstrating the impact donors have on Seton Hall's campus. 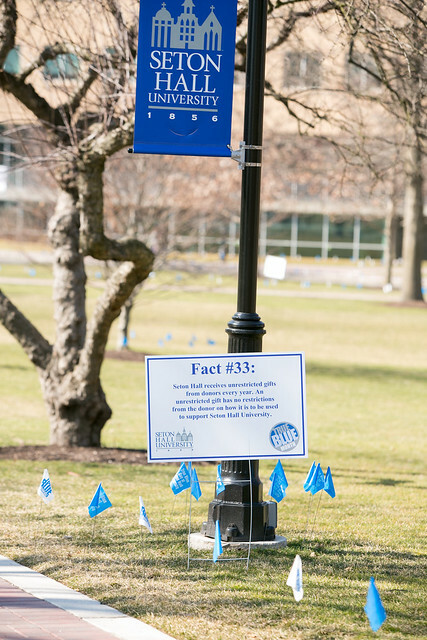 As members walk around the University throughout the day, they will notice flags around the Green that symbolize the number of donors dedicated to the enhancing the Seton Hall experience. They will also notice bows in and around buildings and campus structures which indicate items that were gifted to Seton Hall. After Thanksgiving and the major shopping days that follow (Black Friday, Small Business Saturday and Cyber Monday), comes Giving Tuesday, the international day of giving to philanthropic organizations. All Setonians are encouraged to show Pirate Pride by making their Giving Tuesday gift to Seton Hall in support of the Division of Volunteer Efforts (DOVE). Through the generous support of Pirates everywhere DOVE is able to carry out the Seton Hall mission of servant leadership and create lasting impact on the Seton Hall, local and global communities. Pirates can participate in True Blue Month virtually by answering weekly Seton Hall trivia questions, showing Pirate Pride on social media using #HallTrueBlue and of course by becoming True Blue for the 2018-2019 academic year!